Ever since O-Pee-Chee and Topps both started releasing almost identical sets of hockey cards, it has been the Canadian versions that have traditionally had the greatest appeal. 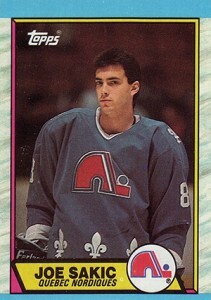 Although it's not very apparent today, there was a time when 1989-90 Topps Hockey was the preferred choice. But, in typical late-1980s fashion, there is so much of both sets out there that it has killed pretty much any premium the Topps cards used to receive. 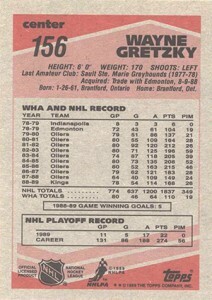 The 1989-90 Topps Hockey set has 198 cards. This is significantly smaller than the 330 cards that make up 1989-90 O-Pee-Chee Hockey, which is common for most years when you compare the two brands. Topps shares the same overall design with the bright blue top and bottom borders and ice-like side borders. Backs use various shades of pink to display vitals, career stats and, in some instances, short written bios. 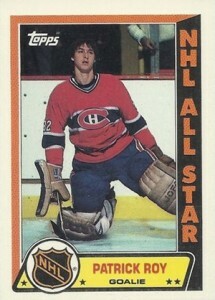 Unlike O-Pee-Chee, which is bilingual, Topps cards are entirely in English. The two sets can be differentiated on the fronts by their logos. 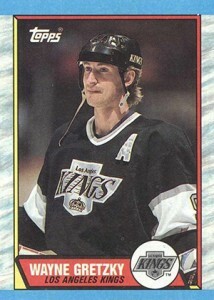 Leading the 1989-90 Topps Hockey checklist are rookie cards of a pair of Hall of Famers, Joe Sakic and Brian Leetch. Sakic in particular is considered one of the best of his generation. Leetch ranks as one of hockey's greatest American-born players of all-time. Second-tier rookies include Trevor Linden, Tony Granato and Kirk McLean. Missing from the set are Theoren Fleury and Gary Roberts, both of whom are in the O-Pee-Chee version. 1989-90 Topps Hockey packs include one sticker as well. The first twelve are players while the final 21 are team logos with jersey numbers and puck icons. 198 cards. Shop for sets on eBay. 16 cards. Included in four-card panels on the bottom of boxes.